It was a good point. I was, after all, meant to be a journalist. Little things like belief and faith should not be getting in the way of getting a good story. Or even the truth. But still I didn’t want to be signing up to something I couldn’t agree with. I mean, what if they were into sacrificing virgins or something? I suppose, in the best traditions of tabloid journalism I could make my excuses and leave, but that was hardly going to clear me of the collective guilt involved if I started to climb the Beaker ladder. No, I needed some facts. And the facts involved a journey over to Milton Keynes Library. So the Beaker Folk. Some shuffling through the books on ancient history and I found out more. The predecessors of the people we call the Celts, in the British Isles. The builders of most of the prehistoric monuments – Stonehenge, Avebury, the Rollright Stones. The users of – or at least the people buried with – large pottery beakers – hence the names. Sometimes the beakers were used to hold the ashes of cremations – and sometimes not. The suspicion was that they were ceremonial, or maybe not. They could have been a sign of status. Or not. And no-one had any idea what gods they did or did not worship. The layout of Stonehenge suggested the Sun. Or, quite possibly, the moon. Or no interest at all in gods, and just an attempt to keep the dead off their backs by making sure the dead knew where to go after passing over. A kind of “you go over there – we stay over here” deal. So it seemed that all the rituals I had been taking part in had been completely invented. Apart from the burning of the Wicker Man, which was apparently a Celtic ceremony. In other words it appeared that the Archdruid was making it all up as she went along, and presenting it as ancient wisdom. But why do that when it was so easy to check it all out for the invention it was? A book I found in the “Mind Body Spirit” section, entitled “Myth, Magic and Memorial – a treasury of Britain’s mysterious past” said that the Beaker Folk had been a peaceful race, led by wise women, who understood the patterns of the world, and used natural earth magic, harnessed by megalithic monuments, to move heavy weights, ensure fruitful harvest and cure rheumatism. The archaeology books said they were a warlike bunch, who oppressed the previous inhabitants of these islands and used to slaughter neighbouring tribesmen so they could steal their wives. I suspected that the Archdruid might agree with the author of “Myth, Magic and Memorial”. And on that basis I knew what my decision would be. So at sundown I was back in the Archdruid’s office, telling her that yes, I would like to join the Novitiative. And asking – just to be on the safe side – whether I would need to pay anything. And being told there was no obligation, but all donations were gratefully accepted; she realised that, since I had no job, the chances were I did not have any spare cash, and she was happy to let me enter either way. I had made my unofficial decision, and now discovered that I had joined the ranks of the Novitiative-in-Waiting. Those ranks consisting of myself, and a married couple called Burghley and Eloisa Anisworth-Goodgrass. They had been Watchers for some time longer than I had – I suspect it just took the Archdruid longer to say their names seven times each. But to make our vows officially, and join the ranks of the Novitiates, we had to wait for the Naming ceremony. And that had to wait for the Moot. And that had to wait for Full Moon. “So what’s a Moot, Burton?” I asked the community’s accountant one evening, as we sat in the Great Field watching the sun set. This was not an official ceremony, you understand – we were just watching the sun set in our spare time, as it were, while we sipped a cup of tea and wished we had satellite TV. Young Keith had joined us, and chipped in some more information. I thanked him, and wondered and worried. The evening of the Moot came. It started at sunset of the day of the Full Moon – which Young Keith had told me was because the Beaker Folk believed that creativity was greatest when the moonlight was strongest. The programme of the evening, for the Mootpeople at least, was pretty packed. After the Moot itself there was the Naming. And then coffee and biscuits. After which we were all to trudge out for the ceremony of Howling at the Moon. As Young Keith pointed out, at this time of year it meant he’d no chance of getting down the White Horse for a quick one. For someone who was popular in the camp, highly regarded by the leadership and clearly quite learned in the Beaker Arts – holding the rank of a Full Bard – Young Keith was remarkably keen on getting in a few at the pub, and despite his attachment to the White Horse seemed to be equally happy at any of the numerous pubs in Woburn and the other surrounding villages – and even as far afield as the Wetherspoons in Milton Keynes. So there I was sitting in the Dining Hall, wearing my loincloth around my waist and covering my knees with my blindfold, alongside the Anisworth-Goodgrasses. Eloisa had made rather a fetching kind of bikini arrangement with a couple of pieces of linen, but none of us were really what you would call comfortable, or warm. A bell rang in the Moot House - a circular, thatched building across the courtyard. We walked across, desperately checking our clothing for looseness and unfortunate gaps and banged on the oak door. A Voice cried – “wait without”. While we waited, we helped each other on with our blindfolds. The door opened, and we heard a voice. IT was Hnaef, resplendent in his ceremonial red hi-viz for Lunetide. He looked at us, shook his head sadly. Ten minutes later we were back in the Moot House, dressed this time, in the middle of a circle of the most senior Beaker People. Each, like Hnaef, wearing the ceremonial red hi-viz and carrying a torch. Now you’re probably thinking that these were those blazing torches like you see in Lord of the Rings or something, a lump of pine with some tar and rags stuck on the end such as one of the Sheriff of Nottingham’s men might have held while searching for Robin Hood in the woods. But no. I later found out that these were not used because given the wattle-and-daub construction of the Moot House, they would have been a fire risk. Instead they used plastic replicas tipped with L.E.D. lights in a range of interesting colours. Young Keith’s even flashed in a number of patterns. I suppose what they lost in authenticity and in plastic construction, they gained in environmental friendliness. Turned out they were even rechargeable. The Anisworth-Goodgrasses and I approached the centre of the ring. The Archdruid stood before us, wearing a high pointed hat, like a witch’s hat but in green and silver, and a red hi-viz waistcoat. What with the clothes and the torch, she looked like a mobile Christmas tree. I wished I had been blessed with the gift of colour-blindness. I was to answer first. I had been considering this deeply. I knew the rules. I had chosen a name that seemed to meet them. I cleared my throat – seemed important to me that for something like this I should speak out clearly. I raised myself up straight and tall. And I spoke. There was a round of applause from the gather Mootpeople. And that was it. Hnaef escorted me to a chair at the side of the Moot House. I was subsequently very grateful to have somewhere to sit, as what happened next took some time. The Archdruid went through the same spiel. And this time it was Burghley to choose. He cleared his throat, raised himself slightly and spoke. There was a shudder of disappointment. The Archdruid looked concerned and caring. A lot more names were suggested and rejected. Including Bigalot, Mandelson, Dawkins and Winehouse. Desperation was setting in. I stood. The Archdruid pointed towards me with the ceremonial cricket bat that she carried as a sign of authority. Eileen pondered for a moment. She tapped the bat on the palm of her left hand – a sign, I knew, of consideration. If she were thinking of actually using the bat she would have been outwardly relaxed. Burghley smiled a relieved smile. He cleared his throat and raised himself slightly. There was a much more muted round of applause. Burghley was led off to sit with me, leaning over to thank me for my idea. Now it was Eloisa’s turn. Same spiel, and then all eyes turned to Eloisa. A couple of weeks passed and we headed towards Midsummer. Still nobody had asked me for any money. Still I was a Novitiate but unsure what exactly that meant I was starting to be doing. I was starting to become increasingly suspicious. Surely they weren’t running this place on the goodwill of the Beaker People I saw around me? But I wasn’t going to get too upset – I had a roof over my head, food and drink, and my wages topping up the bank account every month. I kept quiet; looked and learned; watched the goings-on around me and was polite to anyone who spoke to me. Cordial but quiet. Not giving too much away. You learn that in the Cotswold press pack. I’d nip out of the grounds once a day and phone back to base. Jim, my editor back at the paper, was still very supportive. He’d ask how I was doing, offer a few tips about what I might want to be investigating, and tell me to get a move on. He also posted me a concealed video camera that I could wear about the premises to try and catch any incriminatory evidence. I spent many evenings uploading the recordings of endless dull meetings onto my laptop, in the vain hope that it might add up to an exposé. The Beaker life was simple. At the start of the week a programme was posted on the Community notice board, in the entrance to the Great Hall, telling us what was coming up over the next seven days. Unless there was some major solar or lunar event, the Beaker Folk would start at about 9 am. They didn’t like to wake up too early – which the Archdruid told me was to enable them to keep their batteries stored up, in case they were on New Moon Watch or there was an important sunrise to observe. She certainly stayed up quite late. Long after the sunset ritual of Filling up of Beakers, she was to be seen wandering the meadows that surrounded the Great House, a serious look on her face, pondering the meaning of life. She was never unfriendly – if you met her walking back across the fields from the White Horse, she would smile and say hello – but she never invited company. For the rest of us, the day would progress through a series of workshops, activities and rituals. The Beaker Folk, who claimed to be breaking down the barrier between the Sacred and the Profane, would refer to all these alike as “Occasions”. All very peaceful. All very regular. All very soothing. All, frankly, quite dull. And then my name appeared on the list. I had the call to go and see Drayton Parslow. Drayton’s shadowy figure sometimes seemed to haunt the little Community. Although Arch Assistant to the Archdruid, and therefore number three in the Beaker hierarchy behind Eileen and Hnaef, he was generally regarded as a troublemaker. A boorish little man of about fifty with an argumentative nature and the scruffy beard of a minor prophet – or, indeed, Assistant Archdruid - nobody could quite understand why he was still tolerated by the other two. Some said he had some kind of a “hold” on Eileen, possibly as the result of an earlier romantic entanglement. Others, that he was the Archdruid’s brother, or that in fact he was the Archdruid in disguise, spying out the Community’s views of her. The second of these claims was countered by the Archdruid’s own assertion that her brother was locked in a small room above the Dining Room, only approachable up a flight of stairs behind a bolted door. She was quite happy to let people go in and check, but in practice they were too scared of her brother’s “keeper”, a Mrs Rochester. She would never explain what precisely happened to her brother, only explaining that it was “something nasty” but stressing that no woodsheds were involved. I had no idea what she was talking about. And as to the claim that Drayton was the Archdruid in disguise, this was fairly well discounted when you considered the number of times that you saw them together. Frankly as conspiracy theories go, this was down with the belief that George Formby killed Paul McCartney and replaced him in the Beatles during the recording of “Abbey Road”. But whether Drayton had a hold of some other kind on Eileen, we had no idea. And of course it’s just the kind of conspiracy that you can never really put to bed. Drayton was to be my “mentor” during my Novitiative. Actually he mentored all Novitiates; hence his secondary title “Second Mentor”, and generally people shuddered when they spoke about their time in his care. The belief seemed to be that if you got through your Novitiative without running screaming from the county, you were pretty well set for being a successful Beaker person. Still, speaking as a journalist, I was pleased to be meeting him. After all, this would give me yet another chance to get some insight into what we were supposed to believe – an insight that was still lacking in me up to now. Drayton’s office was down a long corridor from Hnaef’s and Eileen’s lairs. A corridor that became progressively dustier as you walked its length. Where the corridor at the other end had bright lights, and windows, Hnaef’s end of the corridor had no windows. The fluorescent strip-light blinked intermittently and then went out altogether as we walked underneath it, leaving us to make our way to Hnaef’s office by the dim green glow of the emergency light. Which also went out. There was a vague smell of damp and of small, dead creatures. We entered a small, dingy version of what Hnaef’s office had been like. The same wall charts, coloured labels and calendars. However the room was brightened with numerous photographs of Drayton at various locations – Stonehenge, Arbour Low, Avebury, Carnac in Brittany. In each photograph it was raining. Including the one of Drayton posing in front of the pyramids. Some photos included Drayton’s wife – Marjorie, I had heard - and her expression in them was constantly of one whose life was endless doom. Not surprising, seeing that her holidays consisted of viewing ancient monuments in the rain. It was rumoured that Marjorie and Drayton had managed to lose touch when she moved house while he was away on business. This did not entirely surprise me. In response to Drayton’s request, I pulled the office door to. As it closed, I saw the strip light spring back into life outside in the corridor. Unlike the other two leaders, Drayton had no computer in his room. His desk was littered with A4 sized “Red and Black” notebooks. He searched through a pile of ten or eleven on them – carefully lifting each one, checking the label on it and then discarding it, until he found the one labelled “Novitiative”. It was battered and old. He leafed through about two-thirds of the book, opened it, and entered my name in green ink, using a battered old fountain pen. He stood up and ushered me to the door. As he opened it, the strip light outside flickered and went out. He stopped me for a moment as I passed through the doorway, and looked deep into my eyes. Not in that way. More in a searching way. And the door closed and I was left in the darkened corridor, to find my way back to the light. And so, as my Novitiative task, I was set to work in the Doily Mine. At least, that’s what it was jovially called. Doilies were made in a room that was halfway between a shed and a cellar, with a door in the bank under the Dining Room. A rise in the ground meant that the Dining Room, which was on the ground floor if you entered from the front of the house, was directly above the Doily mine, which was at ground level if you walked round the back. It was a wide and deep room, extending probably halfway under the house. At the very back of the room were the cider and mead barrels, where last year’s crop was awaiting consumption. And so I spent a day taking part in the spiritually edifying activity of Banging the Holes out of Doilies. Mrs Whimsey’s Doily Company was one of the many limited companies that had been in the sheaf of papers my boss had thrown at me on Day 1. The outgoings of the company, I had noticed were quite limited – mostly just the blanks of fine white paper. 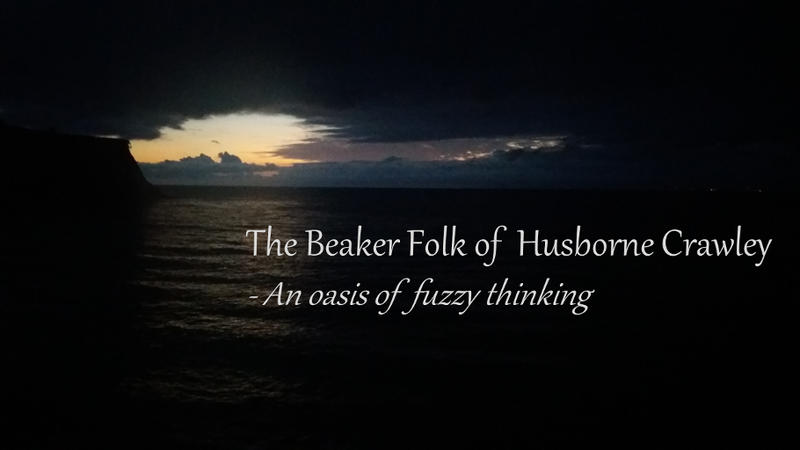 The labour – well, it turned out the labour was provided by Beaker Folk as part of their spiritual development. And since we were volunteers, there was no question of anyone having to worry about the minimum wage. By virtue of its partially underground construction, the Doily Mine was cool and lacking in windows. Just inside the door, piles of paper blanks were stacked waiting for conversion to doilies. Next to them the shrink-wrapped packs of doilies sat on their pallets, waiting for delivery to the doily outlets. Wherever they were. I thought doilies were a thing of the past. And that was what we did for the next four hours. The constant banging of doilies against the bar seemed to be turning my arm muscles into the consistency of spam. There was a vacuum pump in the banging-the-holes-out contraption, which captured most of the chads as they flew out of the doilies, but all the same by lunchtime I was aware that my lungs appeared to be full of lint. Lunchtime was a special Occasion – the first of June or a new moon or something equally significant – but I wasn’t really able to apply the sort of spiritual attention I should have given, as I was too busy coughing up small pieces of paper. The afternoon went much the same way, with my lungs gradually clogging up and my arms going into seizure from whacking the doilies against the bar. After a very long shower, I spent the evening coughing and rubbing liniment into my arms. My appointment with Drayton the next day was cancelled as it clashed with an occultation of Venus. But I grabbed hold of him later on, while he was checking-off a big delivery of hydroponics equipment outside the house, and demanded to know what a religious organisation like the Beaker Folk was doing, putting people into such hazardous working conditions. Well, I never realised that something so spiritual could be achieved by such mindless activity. But then maybe that was what they were trying to tell me. There were four earthly things that defined Beaker worship. Beakers and water were two of them – mostly the latter being poured into and out of the former. And other two went together like a horse and carriage. Pebbles and tea lights. By the time I had been in the community for a few weeks I had noticed the sheer number of occasions on which we were invited to sit quietly, holding a pebble. Once we were asked to feel the surface of the pebbles – rough or smooth – and consider the rough and smooth times in our own life. Another time we were asked to imagine that the pebbles were ourselves, atomic units in the universe longing to know a greater closeness to our neighbours. Since my neighbour on one side at the time was Drayton Parslow, and on the other was the terminal clot Marston Moretaine, this wasn’t a great help to my meditation. On another occasion we were asked to imagine that the stone was the earth – to hold it up in the light to see the way the sun illuminated one or the other side, and to consider the story of sunrise and sunset, sunrise and sunset. “Swiftly flow the years”, as the Archdruid remarked. Or again, one day we entered the Moot House for our morning devotions to find a great pile of rocks that Hnaef had brought back from a trip to the seaside the day before. We held a short period of rejoicing that Hnaef was free and able to join with us – after that unfortunate incident with the police when he mislaid his trunks – and then we built a labyrinth with the stones. Lorelei had a slight problem when she accidentally built herself into a closed loop in the labyrinth. By the time we had persuaded her that she could easily step over a row of pebbles that were only three inches high, she had started hyperventilating. Then there were the tea lights. Again, there seemed to be no end to the ways that these could be used. They were also used to build a labyrinth – labyrinths being, according to the Archdruid, a great spiritual illustration of our wanderings through life, looking for truth and yet also living the experience of wandering to the full. The tea light labyrinth caused some real problems – Lorelei once again - her long, hippy dress catching fire as she progressed between the tea lights. But at least the beakers came in handy, as we threw water over her to put her out. More usually, we would each be asked to come forward to light a tea light – expressing one thought, one prayer as we did so. Or as Young Keith put it, “make a wish!” Or we each held one unlit candle before the first was kindled, then shared the light from one to another. These were very restful things, building up the Community life, but still they never seemed to express any particular religious beliefs. And then one day we had a time of prayer in the Taizé tradition. Unaccompanied by the usual Beaker music group – which itself was a blessing. I had never heard of this tradition, which originated in France. But the songs were in Latin, and my Catholic upbringing gave me some insight into what the words meant. “Laudate Dominum” was one of the songs – “O Praise the Lord” in English. “O Adoramus Te Domine” – “We praise You, O Lord”. “Dona Nobis Pacem” – “Give us Peace”. I asked the Archdruid about these afterwards. Wise words, I thought. Possibly worth putting into practice. By mid-June, my Editor’s patience was starting to wear a little thin. Our daily phone calls had stopped being supportive. Frankly, he was just shouting down the phone at me. Apparently two months was too long for the Ace New Scoopmeister to have taken to deliver a major new item. And that was that. My job was over. If I’d had any outgoings it would have been a problem, but I’d sub-let my flat in early June, and the community seemed to be feeding me fairly well from the crops that grew in the communal allotment, the wheat fields and orchards. At some point I would have to buy some new clothes, but that was a way down the line. And I still had enough savings to cover a few pairs of pants and socks. And I’m a good journalist. That’s what I do. I was sure there was something deep to find, under the spiritual crust of Husborne Crawley. And I was going to find it. I was talking to Bolsted, as the two of us were unloading some sacks of potassium nitrate from the Discrete Herbal Remedies Ltd van. As we dragged the remaining hydroponics bags across to the goods lift, I realised two things. One was that I didn’t actually know where that goods lift went. And the other was that Bolsted was not the sort of person to sound out if you wanted to know what was going on. But Burton Dasset, the community accountant - he was a more likely source of information. On Midsummer’s Eve the two of us were once again watching the sun set. We’d been through the appropriate rituals, and were acutely aware that we’d have to be up by about 3.30 the next morning. But I’d ensured that a few glasses of Pimms, which was the Beaker Folk’s traditional Midsummer drink, had come Burton’s way. He was chatty beyond belief – and I made sure, as best I could, that no member of the Beaker establishment was near enough to hear our conversation. “A real puzzle,” I remarked. “And what about the year before?” I prompted. At this point the Archdruid, who had been hovering in the background, came over to ask me to discuss what I had learnt in the Novitiative. She was terribly supportive. Indeed it was. The biggest event of the Beaker year. I sloped off to bed and set my alarm for 4 am, wanting to ensure I didn’t miss anything. The Beaker Folk had been looking forward to it for months. At 4 am the alarm clanged its way into a rather worrying dream I was having, in which I was being chased and subsequently eaten by a bunch of underworld-dwelling rhinoceroses. It was highly unlikely really to be happening, and even in my dream I realised this, but I was still grateful to be awake. Until I realised what time it was. Of all the hours of the day, of all the days of the year, who thought 4 am was a good time? With the dimmest of half-lights coming through the window, I made my way downstairs past the Health and Safety signs pinned to the wall. “Who checked your drill bit was fastened securely?” asked a poster featuring a man who had one fewer eye than normal, and a chastened look. I met nobody coming downstairs, and there was no-one in the Entrance Hall. I proceeded across the Great Lawn, to the Orchard where the Solstice celebration was due to happen. There was just the Archdruid, Hnaef and Drayton Parslow. No Burton, no Young Keith, and no fifty or so other Beaker Folk. “Thanks for joining us, Willibrord,” said Eileen. We waited in the cold, gazing to the North East as the fore-glow gathered strength in the pinking sky. The first edge of the sun could be seen, shining red above the Amazon warehouse in the Marston Gate industrial park. We sighed at the beauty of it all, there in what would have been silence had it not been for the early-morning roar of the traffic on the M1. The Archdruid drove her staff into the ground, as she had done not long ago for the May celebrations. We chanted the midsummer chant. Then we turned and left. As we walked back towards the Great House, I saw some movement in the corner of my eye. I turned and there – no, surely I was imagining it. The figure looking out over the mists as they drifted across the fields, illuminated by the red light of the strengthening sun. She knew what I was asking. That was obvious. We entered the Great House, and I went back to bed until breakfast time. It had been quite a Summer Solstice. The Exclusion came as a shock. You always knew there was a possibility that someone might be thrown out of the Community, of course. The Book of Beaker Rules contained endless details of what you could and couldn’t do. But Young Keith seemed to break them all with joyful abandon, without suffering the penalties of law. But it was Greengage and Charlesworth that had transgressed. And I never really did find out why. It was a real surprise. They were a fairly ordinary type of suburban couple – Greengage was mousy and diffident while her partner Charlesworth was the sort of testosterone-fuelled, bull-necked banker that you wouldn’t normally have expected to find in a place like this. Although he was always useful if you were looking for a tennis or squash opponent. He sent serves down with terrifying pace and would go bright purple hurling himself around the court. Yet, when the strains of “Lord of the Dance” were lifted in the “Back to the 60s Old-School Christian Hippy Service”, he had been prancing around shaking a tambourine with the best of them. The fires we knew about it was that they were called to see Hnaef every day for a fortnight. And while Hnaef was a welcoming and gentle guy in general, he was also the one that dealt with disciplinary matters. The general consensus was that, when it came to discipline, it was better for all concerned if Eileen was kept out of it. Too prone to violence, was the rumour. And then at dinner one night, we were all requested to assemble in the Orchard at moonrise – at a time very early the following morning. Assuming that attendance was optional, as with Solstice, the next morning I snoozed the alarm on my phone twice before switching it off completely. So I was surprised when Young Keith came in and more-or-less dragged me out of bed. Apparently this one was serious. A dishevelled and grumpy bunch of people stood there in the Bonfire Clearing in the midst of the apple trees, in the pre-dawn twilight, groaning, blinking and belching. Not something to make you think that here was the spiritual powerhouse of the Northern Home Counties. A pile of – inevitably – pallets was stacked at the centre of the semi-circle that the Folk had formed. And then, mystifyingly, we were each given half a dozen golf balls. Through the trees came Hnaef and Eileen. They were each carrying a life-sized plywood image – of Greengage and Charlesworth respectively. They hung them from hooks on two adjacent trees. It was an eerie site, with two people whom we knew so well gazing in effigy across the glade at us. Firm but fair, I thought. Although it crossed my mind that Eileen was pretending a lot of knowledge of a group of people that left no evidence of a legal system – and no writing whatsoever. The mood of the Beaker Folk picked up immensely. Golf balls were flung at the effigies with total unrestraint – most missing, but from the sheer number some were bound to hit, some knocking chunks off the images. A few were thrown so hard that they bounced back off the trees and ricocheted back into the semi-circle, sending Beaker Folk diving for cover. When the golf balls had run out, groups of Folk rushed forward, dragged the images down from the trees and starting to jump on them and smash them. Greengage’s head was snapped from her shoulders. At which point the Archdruid shouted. Charlesworth and the head and torso of Greengage were dumped on the stack of pallets, and the fire lit. As the images caught fire, the Beaker Folk danced around the pyre. It was a traditional, vigorous, stomping, aggressive dance. Stacey ran over to me. “Come on, it’s the Hate Dance! It’s great!” she urged. I joined in – it would have seemed odd not to. And in a funny way it was quite invigorating. The Beaker Band (bodhran, mouth organ and banjo) started up and the pace quickened until everyone was stomping through the ashes, sparks flashing around the grove in the half-light. At breakfast everyone was exhausted, but seemed slightly sheepish – almost as if they were a little ashamed. And no matter how hard I tried, I could get no-one to hazard a guess as to what Greengage and Charlesworth had done. After several attempts, I noticed I was being watched by Drayton, and decided to let the issue drop. But you can’t really let something like that drop. You can stop discussing it with people, sure. But you’re still going to want to know what’s going on. The Archdruid’s office was on a Yale lock. Probably against health and safety, but there you are. When it closed, it locked. But in the warmer weather she was increasingly leaving her windows open. I volunteered for the lawn-mowing job for the afternoon, and went off to mow the croquet lawn. This gave me a long-distance view of Eileen’s window. I could just see her, either typing her morning and evening “thoughts” which she would pin to the notice board, or going through some figures. She spent a lot of time on that computer. I could also see Hnaef in his office. If his conversation over lunch that day was anything to go by, he was probably trying to install the latest version of Ubuntu onto his wristwatch, or something equally as nerdily surreal. Hnaef seemed to spend a lot of his time trying to do unlikely things involving technology, when he wasn’t running his archery school. And his “archery with no thumbs” simulator was one of the wonders of the Internet. My moment came. Eileen had risen, and had now wandered round to Hnaef. With their backs to the window, they were going through a file. I legged it across the lawn and climbed in through Eileen’s open window. Now, I’d been measuring things pretty carefully. I knew there was a decent-sized gap between Eileen’s and Hnaef’s offices. No matter how you looked at it, it would be about 6 feet deep and maybe 12 across – the width of the offices. And I was betting there must be exciting things hidden there. The secrets of the Beaker Folk. And I was betting those exciting things were hidden behind Eileen’s bookcases. Eileen’s bookcases were a wonder in themselves. All three editions of “Stonehenge Complete”. Books written by ley line hunters, crystal healers, dowsers and other oddballs. Books on folklore. Books on religion – books on every religion, from Animism to Zen Buddhism. But was there a hidden catch, or a special lever that made them move? I know, it’s all a bit Gothick. And I couldn’t see any. So I pushed hard on the bookshelf, assuming it would swing round. I know, all very melodramatic. But Eileen’s office had that effect on you. You expected things hidden behind book cases. But I wasn’t expecting the bookshelf to collapse. I found myself on the carpet, laying on my back with a copy of “Iron Age Settlements of Western Europe” covering my face. With a gasp of horror I dragged myself off the floor, grabbed the nearest pile of papers, shoved them into my pocket and threw myself back out of the window. Leaping behind a hedge, I skulked my way back to the mower and continued with tending the croquet lawn. Back at the Great House I could see Eileen and Hnaef, picking up books and bits of broken shelf and pointing at the open window. That evening in my room I sorted through the papers. They were invoices. Some related to various types of soluble fertilisers, and the others were for high-energy lighting and heating systems. So nothing suspicious there. If I were going to discover just what it was that Eileen was hiding it would have to wait for another day. And so the summer kicked in. As if the Earth Magic of the Solstice had itself changed the nature of the season. The green and juicy leaves of June started to hang limp around lunchtime in the toasting suns of July. And the nature of the Occasions changed as the warm weather came in. There was a lot more standing around outside, and less cowering from the weather in the Moot House. With the first session of haymaking past, and the apple and wheat harvests to look forward to, in fact there was very little work to do. Even the doily bashing was less pressing. And so one morning I made my way from breakfast to the Doily Shed and found Marston Mortaine standing there. As I think I previously mentioned, Marston was generally recognised as being a terminal clot of the highest order, and had spent a record six months as a Watcher before finally being received into the Novitiative, where he had been stuck ever since. Up to this point he had been kept out of the Doily Shed, due to Drayton’s suspicion that he might break something. I turned to see Hnaef. And then it all moved quite fast. A sack was shoved over my head, someone whacked me behind the knees so that my legs buckled, and then strong arms picked me up and dumped me in what – as far as I could tell – was a supermarket trolley. I felt myself being wheeled at high speed. Although my position in the trolley was such that I was in agony, I could tell by the relative lack of bouncing around that I was actually being wheeled down the smooth gravel path towards the Moot House. A song was echoing around me, in amongst the laughter of a number of voices that, as far as I could tell, included Young Keith. It was Hnaef, singing the Chorus of the Hebrew Slaves from Aida. So apparently this was official. When we came to rest in what I assumed was the Moot House, the trolley was spun round a number of times. Dizzy and disorientated, I was tipped out and lay on the floor. I dragged the bag off my head. Eileen and Drayton were standing above me. “Willibrord, it is time for your Gradualation,” said Eileen. I gasped from my position on the floor. “You have banged the holes from your 96,000th doily,” explained Drayton. I approached the Archdruid and her two deputies, standing in front of their ceremonial chairs. For some reason that hadn’t occurred to me. I’d crawled all the way there from my position. I stood up. “Kneel, Willibrord,” instructed Drayton. I knelt for a number of minutes. Behind me I heard the murmurs and footsteps of people entering the Moot House. After the noise died away, there was just the sound of a handbell being rung repeatedly. My knees started to ache. I shifted awkwardly. “We have no holy book with which to mark your gradualation,” intoned Hnaef, “only the leaves of the trees.” And he dropped a handful of leaves onto my head and shoulders. They mostly dropped to the ground, although a couple lodged in my hair. “We have no sacred food to welcome you here,” chanted Drayton, “only the fruits of the trees.” And he dropped a handful of strawberries onto my head and shoulders. Needless to say, they all fell to the ground. I should have been expecting the beaker-full of water that was poured over my head at this point. But even if I had, I could never have dreamt how cold it was on such a warm day. Or how much of it there was. I gasped and spluttered and struggled to my feet. Any thoughts of complaining were washed away by the applause from the full members of the Beaker People, who had entered the Moot House while I was kneeling there. As I stood there, a couple of berries squashed into the knees of my jeans, and soaked down my head, neck and back with spring water, a wave of happiness crashed over me in much the way the water had. I was wanted. I was loved. I was a part of this. I was spiritually lint-free. I was… a Gradualate? Afterwards in the garden at the White Horse I struggled to understand what had happened there. Over the hedges came the sounds of the local kids setting fire to the playground, the sun shone in my eyes and the growl of the motorway was as fierce as ever as the rush-hour commuters went home. It was in many ways an idyllic English summer’s early evening. The make-up of the Community changed as we moved into the summer season. Some of the resident Folk went off on their holidays, and the Archdruid nipped off for what turned out to be a month in the Caribbean, but these were more than made up for by the pilgrims who flooded in. Some were just weekenders or day trippers – we were very conveniently located for London – but others stayed for one or even several weeks. Along with the other resident Beaker People I began spending quite a lot of time leading the pilgrims in their spiritual exercises. That first time came as a revelation. Hnaef had asked me the previous evening if, now I was a gradualate, I’d cover for him at the Sunday Awakening exercise. This was one of the ceremonies that saw a far greater attendance from pilgrims than from the residents – not surprising since it took place to greet the sunrise, which meant another 5 am start at that season. Pilgrims were keen and gormless, whereas the old lags were normally sleeping off the previous night’s session at the White Horse. I’d asked Young Keith if he would come to give me moral support, but he had politely refused. So there I was, in the Lammas early morning sunlight (Lammas being the 1st of August, but the Beaker Folk attached the term “Lammastide” to the whole week afterwards) with nine weekenders looking at me with bright shining eyes. The weekend so far had been a great success, by all accounts – four of them had found themselves, while another two encountered a sense of the divine. And six out of nine with second-grade spiritual experiences was a pretty good strike rate. I couldn’t read the next instruction on the crib sheet. Hnaef had scribbled it down for me. Was that “Tibetan Reflex” or “Totally Relax”? I struggled to remember whether I had taken part in any Tibetan Reflex exercises. I heard some gasping noises. “And out. And relax”. A number of blue-looking pilgrims panted for a while. At least, I reflected, the hyperventilation would encourage them to have spiritual experiences. There was a momentary pause while we waited for one of the pilgrims to pick himself off the ground. He had made the elementary mistake of raising his left foot before he had put the right foot back down. I made a mental note that he was just the sort of person the Community could do with as a full-time member. Eileen didn’t seem to like her inmates too bright. I was starting to be intoxicated by the power. These pilgrims followed my every command! I was able to take them through a series of completely implausible commands, all of which they followed with total attention and beatific expressions on their faces. So taken aback by their obedience was I, that I encouraged them all to gaze raptly at the rising sun until they felt their souls melt. In the event it was their retinas that suffered a severe reaction, and I had to lead them all back for a quiet sit in the dark of the Moot House before any of them were much good to take themselves back out into the daylight. Oddly enough, they didn’t hold it against me. When they could see again, two or three of them came to see me specially to thank me for their illuminating experience. I told her that it would be best if she didn’t; that there was something in the holy air of Husborne Crawley that meant you would get away with such behaviour but this wouldn’t apply elsewhere. Confronted by this complete pile of old donkey droppings, she merely nodded humbly and accepted my judgement. And so I discovered my true calling. I loved spiritual leadership. I’d like to say that I was full of humility, that I found my true self in service, that I was merely a facilitator for others to find their true spiritual depths – the ferryman for their crossing on the River of Dreams. But the fact is that my newly-found power gave me such a buzz. Of course, when I fed all this back to Hnaef I referred to it as “fulfilment”. He seemed to realise what I meant. But I started to receive more small-group leadership opportunities. I wasn’t going to complain – firstly, these duties went with a set amount of “expenses”, which came in very handy for buying some new clothes and electronic gadgets. But I was also finding that being the one in a position of spiritual authority was very attractive to a certain kind of female pilgrim. Maybe slightly older than I would have been looking for in the outside world – mostly divorced, although a number of them seemed rather to have left their husbands at home. There was a feedback effect. The more people saw me as a guru, the more my confidence grew. And the more it grew, the more guru-like I became. And the more guru-like I was, the more that certain kind of woman seemed attracted to me. And maybe it was the sense of power, or maybe it was simply that I’d been so long without a girlfriend of my own. At any rate, somewhere down the line, well let’s say that I benefited physically from my spiritual position. At the time it seemed so great – with this woman who saw me as some kind of a spiritual mentor – but afterwards I had a sense of – well, not guilt. Don’t forget I’m a journalist. Let’s say, rather, concern that I was going to be in trouble with the hierarchy. Not wanting Eileen or one of the other leaders to know at this stage, I ran it past Young Keith. I indicated that I’d rather he did not continue to use that term, but that was indeed essentially what I had been doing. And he’d put quite a fine point on it. So I found I was more sexually fulfilled, and yet, it has to be said, less so spiritually.